Understanding and characterizing structural and bonding properties of the carbon-hydrogen (C-H) system over a broad range of conditions is crucial for developing new high-strength materials for energy applications. 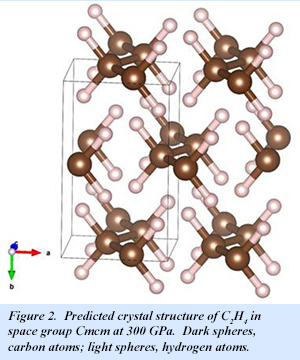 In addition, examination of the C-H system in extreme environments also plays an important role in the search for new materials with novel electronic properties such as high temperature superconductivity. The carbon-hydrogen (C-H) system at ambient conditions forms the basis of organic chemistry, and gives rise to compounds that are the predominant fuels in traditional energy technologies. Despite its importance, however, the behavior of simple molecular species in the C−H system under extreme conditions is poorly understood. The assumption that hydrocarbons should dissociate into elemental carbon and molecular hydrogen at around 10 GPa has been the prevailing one for many years. At megabar pressures and higher, a focus on the intriguing properties of these endmembers has left intermediate compositions largely unexplored. Now, an EFree group including postdoctoral associate Hanyu Liu, Director Russell Hemley, and Carnegie research scientist Ivan Naumov has identified new structures in this chemical system at 100 to 300 GPa using first-principles computational methods. The study builds on previous work in EFree led by the Cornell group [X. D. Wen et al., Proc. Natl. Acad. Sci. USA 108, 6833-6837 (2011)]. 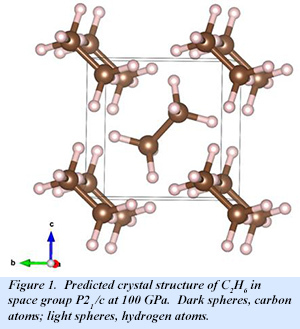 At 100 GPa, a C2H6 phase with P 21/c symmetry is the most stable structure, while a C2H4 phase is also stable. The molecular form of C2H6 is retained in the high pressure solid (Fig. 1). With increasing pressure, C2H6 becomes less stable until at 300 GPa, C2H4 is the only stable phase. At this pressure, C2H4 adopts Cmcm symmetry, with the molecular form also retained (Fig. 2). 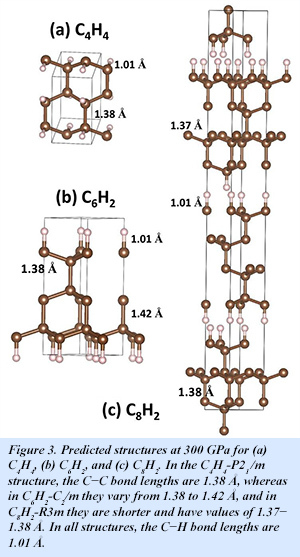 Even at 300 GPa, Cmcm-C2H6 is an insulator with an indirect band gap of 3.7 eV. Toward the carbon-rich end of the composition space, two phases also appear with low enthalpies: C6H2 and C8H2. In both cases, the predicted structures feature adamantane-like structural motifs similar to those observed in diamond [H. Liu et al., J. Phys. Chem. Lett. 7, 4218-4222 (2016)].